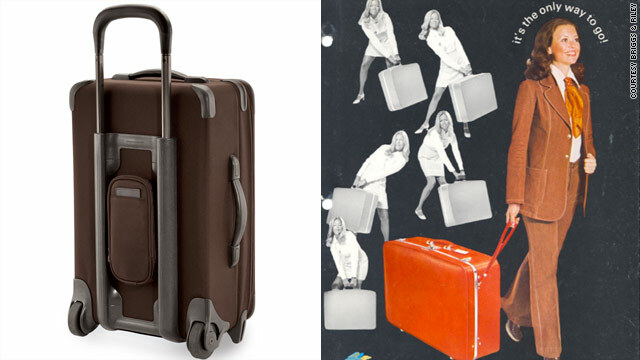 U.S. Luggage debuted its wheeled suitcase in 1970. A modern-day Briggs & Riley bag shows how luggage has evolved. (CNN) -- Wheels on a suitcase? So convenient, they're an unremarkable essential for today's traveler. But in 1970, Bernard Sadow had trouble selling his rolling suitcase idea. Sadow, 85, was inspired 40 years ago as he was going through customs at an airport in Puerto Rico, on the way back from Aruba with his wife and kids. He was wrestling with two large, tightly packed 27-inch suitcases, without a porter in sight, when he spotted a man moving a piece of machinery on a wheeled platform. "He had the machinery, and he was just pushing it along without much effort, and I said to my wife, 'That's what we need! We need wheels on luggage.' "
Sadow was in the luggage business and is the former president and owner of U.S. Luggage, now part of Briggs & Riley Travelware. He attached four casters, like those used on trunks, to the bottom of a suitcase and added a flexible strap, and off to market he went, with a suitcase trailing behind him. After weeks of rejection from department stores, including Macy's, Sadow had a meeting with a Macy's vice president who was impressed with his idea. The Macy's buyer who had recently shown him the door agreed with his boss, and a product was born. Sadow applied for a U.S. patent in 1970, and in 1972, he was granted the first successful patent on wheeled suitcases. Macy's sold the first suitcases in October 1970. Sadow held the patent for about two years until competitors banded together and successfully broke the patent, opening up the market to wheeled luggage. Granted, those first wheeled suitcases were, well, unwieldy. Wobbling and tipping were problems for travelers pulling large suitcases with wheels mounted on the narrow bottom. It took nearly 20 years for the next advance in rolling luggage. Pulled on two wheels with a retractable handle, today's standard issue black suitcase was invented in the late '80s by Northwest Airlines pilot Bob Plath. His "Rollaboard" was the start of the luggage company Travelpro. But the wheels came first, and the luggage that followed has changed the way people travel. Was putting wheels on a suitcase the best idea Sadow ever had? "It's one of them," he said, laughing.